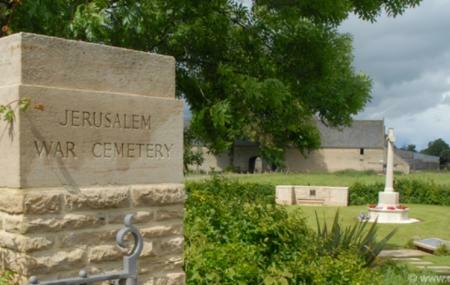 The Jerusalem War Cemetery is the smallest cemetery in the city of Bayeux. The cemetery lies at the foot of a hill stretch situated 9 kilometers south east of Bayeux. The cemetery is referred to as the first Commonwealth War Graves Commission Second World War. The cemetery is home to about 47 burials and is very well maintained. On your visit to this cemetery, make sure you also pay a visit to the neighboring Normandy museum. The cemetery is open 365 days of the year. Visit the cemetery only during the day. How popular is Jerusalem War Cemetery? People normally club together Museum Of The Battle Of Normandy and Longues-sur-mer while planning their visit to Jerusalem War Cemetery.